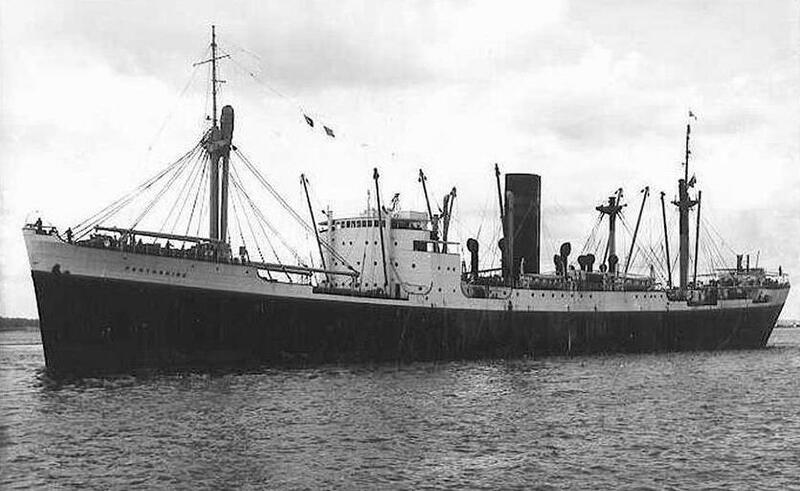 At 8.15pm on the evening of 13th January 1960 the Rea Tug APPLEGARTH was rammed and sunk by the Scottish Shire liner PERTHSHIRE off the Alfred Locks at Birkenhead. The entire crew of seven of the APPLEGARTH was lost. "Seaforth Radio, 13th January 1960. Following received from British steamer PERTHSHIRE (Glasgow for Beira) at 8.13pm GMT: Just sank tug APPLEGARTH south of Woodside in River Mersey"
The loss of the APPLEGARTH, with the seven men aboard her, is remembered around Merseyside to this day. Over fifty years since it happened, I would allude to the bare, bleached bones of it, and often the person I was talking to would straightaway say the name APPLEGARTH. In the Maritime Museum on the Albert Dock in Liverpool, I read this account of the sinking: 'During the long history of the Mersey towage service, casualties of a similar nature have occurred from time to time, but the loss of the APPLEGARTH ranks as one of the worst disasters of its kind on the river and came as a grievous shock to everyone associated with the shipping of the port of Liverpool'. On 13th January 1960, the 10,496-ton cargo liner PERTHSHIRE was putting into port in Birkenhead, a stop on her voyage from Glasgow to Beira in Mozambique. It was a cold, cloudy night on the river; one Fleet Street newspaper talked about a 'murky darkness'. The river was running at three to four knots. Three tugboats were guiding the PERTHSHIRE; her speed was between four and five knots. The lead tug was the 231-ton APPLEGARTH, standing off the liner's bow. She had a line aboard the PERTHSHIRE, ready to tow her. Then, without warning, the PERTHSHIRE was bearing down on the APPLEGARTH fast. On the deck of the liner the tow-rope went slack around the windlass. The bow of the PERTHSHIRE was as high as a house. No one on the liner could see the tug by now. But the crew of the APPLEGARTH must have made out the bulk of the liner behind them and heard her avalanching towards them; at least three of them were on deck. They felt a violent lurch and heard a deafening buckling noise. The PERTHSHIRE had rammed the APPLEGARTH, her bow plating battering the starboard quarter of the tug. The APPLEGARTH listed to port, canting towards the bow of the liner. This was the first collision but not the decisive one. Not everyone aboard the liner even felt the impact. If it had taken the crew of the tug unawares, they recognised danger now. 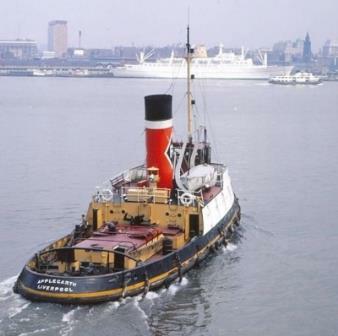 As the tug scraped down the bow of the PERTHSHIRE, the order was given to go full ahead. It seems the master of the APPLEGARTH intended to slip out from beneath the overhang of the PERTHSHIRE's bow, to outrun the danger. But however fast its engines raced, the tug was sucked back against the liner's bow as the water beneath the tug rushed to replace the eleven thousand tons displaced by the PERTHSHIRE. The acceleration only propelled the tug along the plating of the PERTHSHIRE until she was directly in front of the liner. The PERTHSHIRE's bow struck the APPLEGARTH broadside on, tipping her port bulwark under water, where it met the irresistable flow of the river. Men watching from the APPLEGARTH's sister tugs said she seemed to hang there for two or three seconds, pinioned between the liner and the current. The PERTHSHIRE couldn't stop. The tug rolled to port, and under the freezing Mersey. The APPLEGARTH was small, but she was solid, dense. 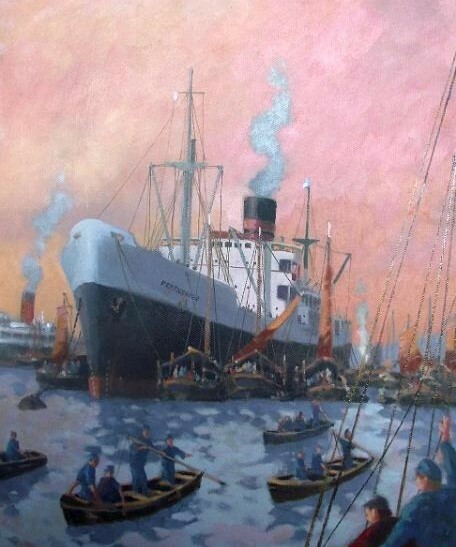 She had her hatches open - this wasn't open sea, after all, but the river, barely a hundred yards from a landing stage where office workers caught the ferry to Liverpool every morning - and her companionways, her cabin and her galley filled with water. By now everyone on the scene, even those on the bridge of the PERTHSHIRE, realised that something terrible was happening. They could here cries from the river. They could see the light of the tug's wheelhouse, the wrong way up and under water. 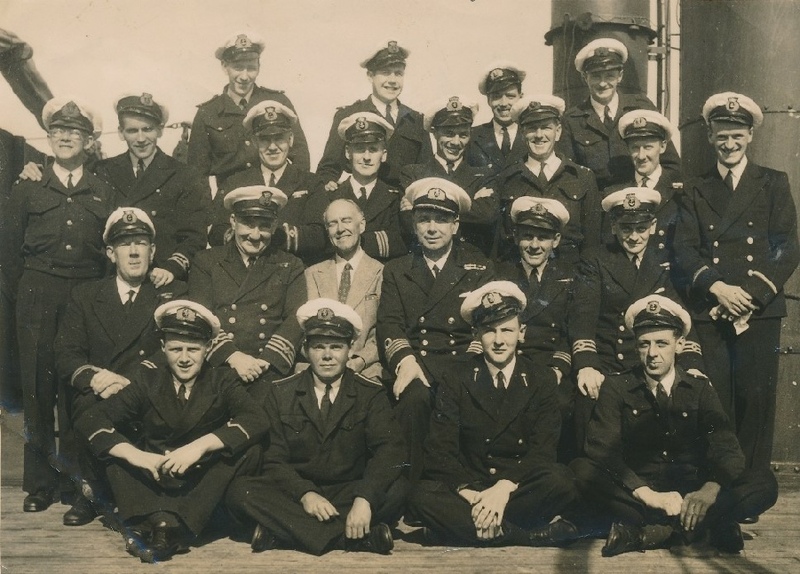 It is probably in the early 50s as most of them have Clan Line badges on their caps rather than B&C. and Captain Hogg was in command of Argyllshire from her launch in 1956 until he retired in 1960. An edict was issued early in WWII that the standard regulation MN braid was used instead of company livery during the war period, this was not a material saving decision but for identification purposes or capture, in the latter case it proved to be a self defeating, as from records most officers discarded their uniforms if having to take to the boats after being sunk, as U-Boat captains, if taking prisoners, usually took Masters, Chief Officers and Chief engineers to deprive the MN of experienced personnel. After the war clothing was rationed, as was livery material, even though the MN got an enhanced clothing allowance, it took sometime for company livery to re-appear. Battle Dress was usually worn on deck as the working uniform, especially on trampers, it was also much easier to put on over a roll neck pullover when transitting the N Atlantic and such like seas, was still very popular right up to the '80's : uniform de riguer on the 0000-0400 watch, who wants a collar and tie at that time!